Photograph of Mt. Thor, believed to be one of the locations associated with SCP-2403. Special Containment Procedures: The east stairwell of Research Site-45, between the 1st and 3rd floors, is to be closed to personnel indefinitely. Access to the 2nd floor landing will be blocked with reinforced concrete with a steel blast door on the 1st floor landing to be locked at all times. Testing on SCP-2403 has been suspended until further notice. Description: SCP-2403 is a phenomenon currently isolated within the east stairwell of Research Site-45, between the last step of the stair flight of the 2nd floor and the 2nd floor landing. Whenever a sentient bipedal being descends the stairwell and crosses over the last step of the 2nd floor, they will be instantly transported to another location in space-time. 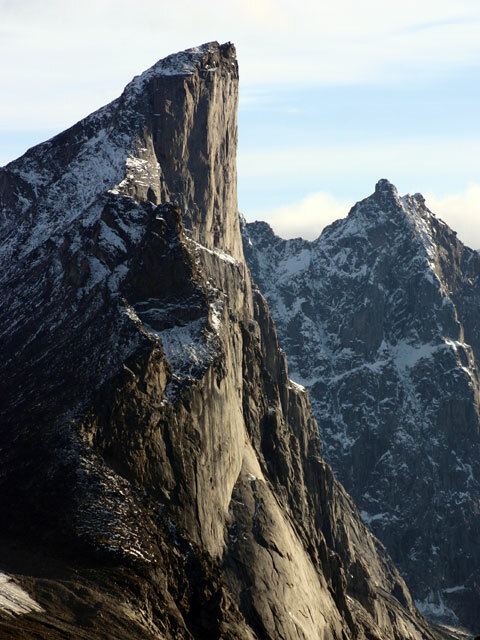 In all cases, the locations are observed to be mainly areas of high altitude with abrupt vertical cliff faces. Any subject transported by SCP-2403 will be positioned to step and fall off these cliff faces, regardless of any foreknowledge of the phenomenon. Subjects will experience free-fall at a normal rate during this phase. Before making contact with the ground, subjects will be instantly transported onto the 2nd floor landing. Subjects will experience a slight time dilation effect as the time at the point origin from when they disappear and reappear is nearly instantaneous. However, subjects will experience the full duration of the free-fall and retain a memory of the event. No other physical objects or properties have been seen to return with the subject such as rainwater (if applicable), dust particulate, gas trapped in the subject's lungs, subject's inertia, or subject's momentum. Testing has proven that there is a correlation between stairs traveled in a single stride with locations, although the precision of these results is currently inconclusive. Procedure: Subject is asked to descend SCP-2403 at a normal pace while wearing a portable video recorder. Observation: Subject descends the last step normally. Upon making contact with the landing, the subject starts screaming in a panicked state. Subject remains in a panicked state for five seconds before appearing disoriented and then stumbling toward the adjacent wall while breathing heavily. Video Analysis: Video captured a full 5.5 seconds of free-fall footage with the subject screaming for the entire duration. After stabilization of the video was applied, the location was confirmed to be a bridge possibly in the western United States. Bridge is positioned over a gorge estimated to be 350 meters in depth. Based on a structural analysis of the bridge, it is thought to have been built within the last 30 years. Procedure: Subject is asked to descend SCP-2403 at a normal pace while wearing a portable video recorder. Subject is also instructed to jump over the last step and onto the landing. Observation: Subject descends and makes the jump over the last step. Upon making contact with the landing, the subject collapses in an unconscious state. Subject is treated in the infirmary for sudden cardiac arrest and revived. During the debriefing, subject has no detailed memory of the event other than the sensation of falling. Video Analysis: Video captured a full 18.9 seconds of free-fall footage with the subject believed to be only conscious for the first 5.8 seconds. Analysis of the video was able to identify several important landmarks that were able to confirm the location as the Store Trolltind, which is Europe’s highest cliff. Date at the location was unable to be determined. Procedure: Subject is asked to descend SCP-2403 at a normal pace while wearing a portable video recorder. Subject is also instructed to jump over the last three steps and onto the landing. Observation: Subject descends and makes the jump over the last three steps. Upon making contact with the landing the subject's body, now dead, collapses. An autopsy performed showed the cause of death to be sudden depressurization as most of the organs and skin tissues were ruptured. Video Analysis: Video captured a full 1.1 minutes of free-fall footage with the subject believed to be alive for an estimated 10 seconds. Analysis of the video was unable to confirm a terrestrial location. Further video analysis in conjunction with the autopsy report posited the location to be on the planet Mars, possibly along the high cliffs surrounding the Echus Chasma crater. Confirmation is pending following further review of this data. Procedure: Subject is asked to descend SCP-2403 at a normal pace while wearing a portable video recorder and a NASA Z-1 spacesuit. Video recorder has been upgraded to be able to function in hostile environmental conditions. Subject is also instructed to jump over the last half of the flight and onto the landing. Observation: Subject descends and makes the jump from halfway down the flight. Upon making contact with the landing the subject's body shatters inside the suit. The remains of the subject were observed to be frozen solid and the suit appears to have been torn along the right leg. Video recorder unit was damaged, but intact. Video Analysis: Video captured a full 12.2 minutes of freefall footage. After 5.1 minutes of free-fall, the subject experiences a hard impact against the wall, rupturing the suit. Death occurred 23 seconds after this event. Analysis of the video showed a low gravity environment in extreme cold conditions. Footage also reveals the entire surface to be solid ice. Comparing certain sections of footage looking up at the sky with known star charts, it is determined that the location is located outside of the known local solar system. Procedure: Subject is wearing a portable video recorder and a NASA Z-1 spacesuit. Video recorder has been upgraded to be able to function in hostile environmental conditions. Subject is instructed to jump over the flight of stairs and onto the landing below. Observation: Subject makes his hesitations known to the researchers and security present. Subject is assured that any injuries sustained from the fall will be treated in the infirmary. Subject continues to be uncooperative. The security team present then convince the subject to participate. Subject makes a running start on the landing above and jumps to the landing below, successfully clearing the entire flight. Subject disappeared right before making contact with the bottom landing. No sign of the subject or the video recorder unit exiting was observed. Video Analysis: Inconclusive pending retrieval of the video recorder unit. However, an adjacent lab detected a burst of beta radiation on-site at the exact time the test was conducted. Data has been logged for further review.